This t-shirt shows a skater that wants to be the next President of the United States Of America. Yes you seen it right on the skateboard you can see Bernie Sanders and he seems to have the tricks under control. And his blue skateboard says “Bernie” on it so that you know who to vote for when it is election time. 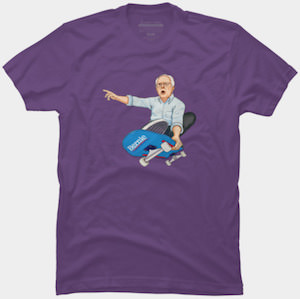 You can get this funny Bernie Sanders t-shirt in styles for men, women and kids and yes you can pick a cool color and the size that fits you best. If you want Bernie to roll around on his skateboard in the Whitehouse then wear this t-shirt to promote him.